Uglyworld #716 - The Art Of Denial (224-365), originally uploaded by www.bazpics.com. 2. (a) A refusal to grant the truth of a statement or allegation; a contradiction, (b) Law The opposing by a defendant of an allegation of the plaintiff. 3. (a) A refusal to accept or believe something, such as a doctrine or belief, (b) Psychology An unconscious defense mechanism characterized by refusal to acknowledge painful realities, thoughts, or feelings. 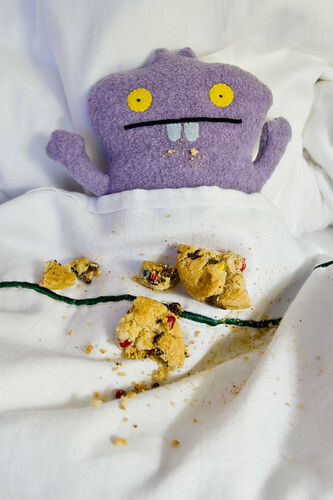 There's what the dictionary says about the word denial, now what do you think Babo says when asked why he's been eating cookies in bed AGAIN?!?!?! His answer is simple - "Wasn't me's!". Methinks he's still got some way to go to fully master this dark art...and more importantly he needs to learn to get rid of the evidence first!